Southern Utah University's Sammy Cole has picked up third-team academic All-American honors, as announced by the College Sports Information Directors of America (CoSIDA). The 2014 Capital One Academic All-America Division I men's and women's at-large teams include student athletes from fencing, golf, gymnastics, ice hockey, lacrosse, rifle, skiing, swimming and diving, tennis and water polo. Cole was eligible for the award after earning Academic All-District 8 honors in May with a perfect grade point average throughout his collegiate career. The junior, from Alisa Viejo, Calif., led the Thunderbirds with a 72.3 stroke average — the third-best mark in SUU history — this past season, when he had an SUU-best seven top-20 finishes, including a team-high four in the top-10. 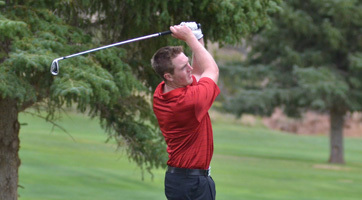 He closed the year very strong, with top-10 finishes in four of the team’s six spring tournaments. His season also left him with a 73.7 career stroke average, the second-best in school history. Southern Utah University student athletes have now garnered back-to-back academic All-American citations; Thunderbird gymnast Caitlin Kennedy was named to the second team in 2013.